Oversized Clutch There are 30 products. An oversized clutch bag handmade with beautiful embroidered textile. This bohemian embroidered clutch bag is the perfect clutch purse for festive occasions Height: 10" Length: 13"
A boho chic style large clutch bag handmade with pom pom's in Thailand. This boho bag is a unique clutch purse perfect for everyday use. Height: 10" Length: 13"
A boho chic style laptop bag ethically handmade in Thailand. Dimensions:Approx Length: 13" (33cm)Approx Width: 0" (0cm)Approx Height: 9" (23cm) Please note this bag take approximately 2-3days to make. 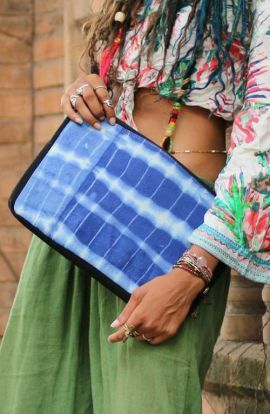 A boho oversized clutch bag handmade with beautiful embroidered textile and sky blue tassels, this blue boho clutch is perfect as a wedding clutch. Height: 10" Length: 13"
A boho chic style oversized clutch purse handmade with embroidered textile. This blue tasselled purple wave boho bag is the perfect clutch bag for all festive occasion. Height: 10"Length: 13"